DETROIT (Feb. 27, 2016) – Chevrolet swept the top three qualifying positions Pro Stock and John Force Racing drivers earned the Nos. 2, 3 and 4 qualifying spots in Funny Car at the 32nd CARQUEST Auto Parts NHRA Nationals at Wild Horse Pass Motorsports Park in Chandler, Arizona. 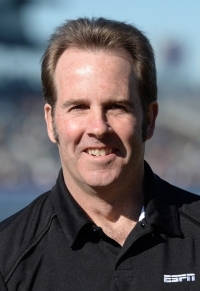 Bo Butner (Butner Auto Sales Chevrolet Camaro SS) earned his inaugural National Hot Rod Association (NHRA) Pro Stock No. 1 qualifying position in his 19th start and became the 61st driver to achieve the distinction. His pass of 6.618 seconds at 208.88 mph in the opening round held up throughout the succeeding three rounds of qualifying in the Mellow Yello NHRA Drag Racing Series event. Butner, a semifinalist at the season-opening Winternationals two weeks ago, will face V. Gaines in a first-round matchup, with the winner earning a bye into the semifinals. “I’d like to get past V., get to the finals and win. That’s our goal every time when we leave the house,” Butner added. Courtney Force, who set a track record for elapsed time in her Traxxas Chevrolet Camaro SS Funny Car with a run of 3.930 seconds in the first round of qualifications, matched her 2015 qualifying effort of second at Wild Horse Pass. Ron Capps vaulted to the No. 1 qualifying position in the fourth round, bumping Force by 0.005 of a second. John Force, who has a record eight victories at the venue in the desert, moved from eighth to third in the fourth round of qualifying with a blistering pass of 3.938/323.81 in the PEAK Antifreeze/Republic Services Chevrolet Camaro SS. Robert Hight had a best run of 3.945/319.14 in the Auto Club Chevrolet Camaro SS to qualify fourth. In Top Fuel, Brittany Force recorded her best pass of the weekend in Round 4 at 3.769/321.04 in the Monster Energy Chevrolet Dragster for John Force Racing to move up one position to fifth. She was the event runner-up in Top Fuel in 2014. Chevrolet drivers occupy five of the seven positions that constitute the top half of the Pro Stock field heading into eliminations. Jason Line (Summit Racing Equipment Chevrolet Camaro SS) faced Butner in Round 4 and remained the No. 2 qualifier with a best run of 6.622/208.17. KB Racing teammate Greg Anderson, who beat Line in the final of the Winternationals, qualified third in the Summit Racing Equipment Chevrolet Camaro SS. He recorded a pass of 6.623/207.72, which was the quickest of the session. Chris McGaha (Harlow Sammons of Odessa Chevrolet Camaro SS) qualified fifth and Drew Skillman, who qualified second and reached the semifinals last year at Wild Horse Pass in his second Pro Stock event, qualified sixth in the Ray Skillman Chevrolet Camaro SS. Alex Laughlin (Gas Monkey Garage Chevrolet Camaro SS), another second-year Pro Stock driver, qualified seventh. Laughlin is being coached this weekend by 2004 Indianapolis 500 winner Buddy Rice, a friend who has been working with the team. “He told me, ‘You’re the quarterback, and you need to keep your guys in a good mood and keep morale up when times are hard. You have two more shots today. We’ll get it,’ ’’ Laughlin said. Joey Grose (Skyler Electric/Big Chief Chevrolet Camaro SS) qualified 10th, while Vincent Nobile (Mountain View Tire Chevrolet Camaro SS) qualified 12th and Matt Hartford (Total Seal/CIP1/Nitro Fish Chevrolet Camaro SS) qualified 13th. 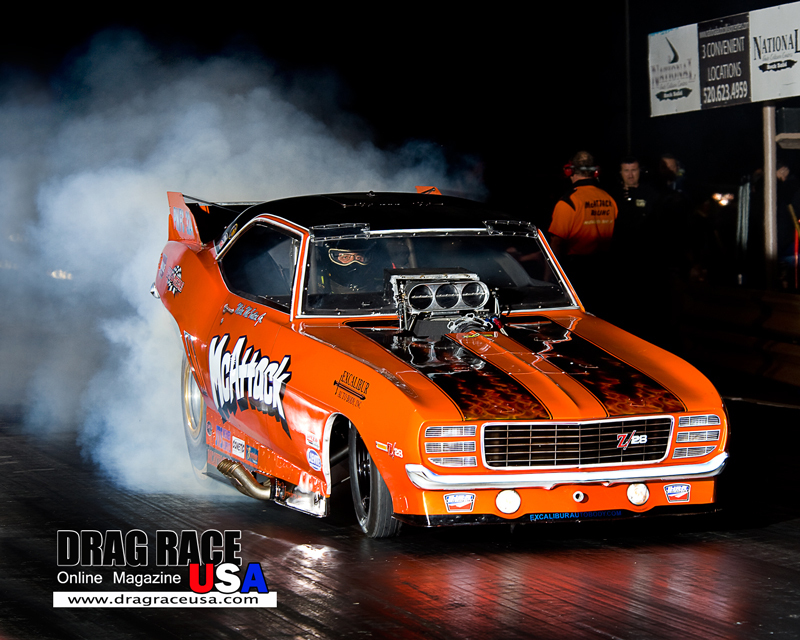 In Stock Eliminator, Dan Fletcher (PEAK/K&N/ATI Chevrolet COPO Camaro) qualified 34th (of 57). Fletcher won the class in the opener at Pomona. In Super Stock, Rodger Comstock (MTS/Hoosier/Lucas Oil/MCNX WR Chevrolet COPO Camaro) qualified 50th and Bryan Broaddus (DNB ENGINEERING Chevrolet COPO Camaro) qualified 53rd.